My consolation prize for not being in Honduras is this week’s CSA delivery. The cabbage and the sweet potatoes will be fine till we get back. So will the eggs, peas, and rice. The beets probably would be too, but I love beets and want them now. They’re better the fresher they are, too. 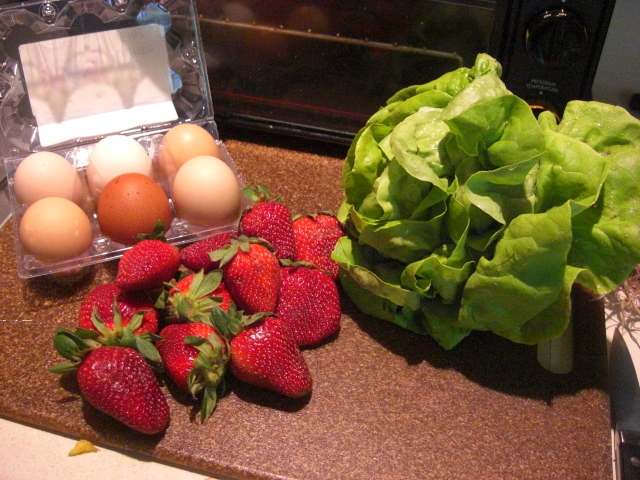 The lettuce, spinach, herbs, tomatoes and green onions have to be eaten, so this week’s going to be all about salad, too. Lettuce, spinach, tomatoes, and chilled beet slices. 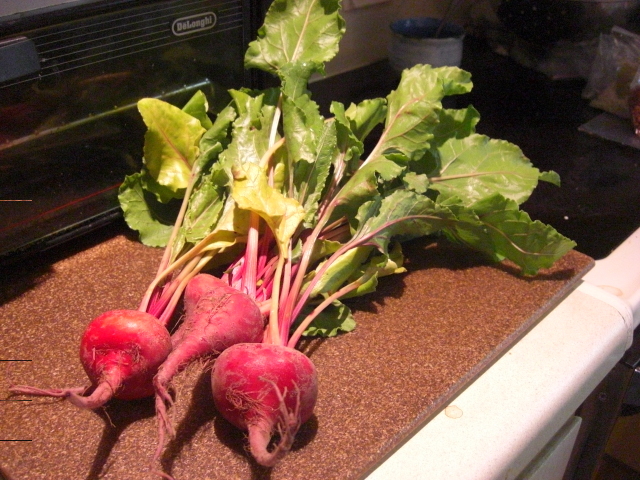 I’ve roasted the beets, and they’re now chilling in the fridge for tonight’s salad. Not sure if we’ll make it through all the spinach before Saturday, but we’ll try. 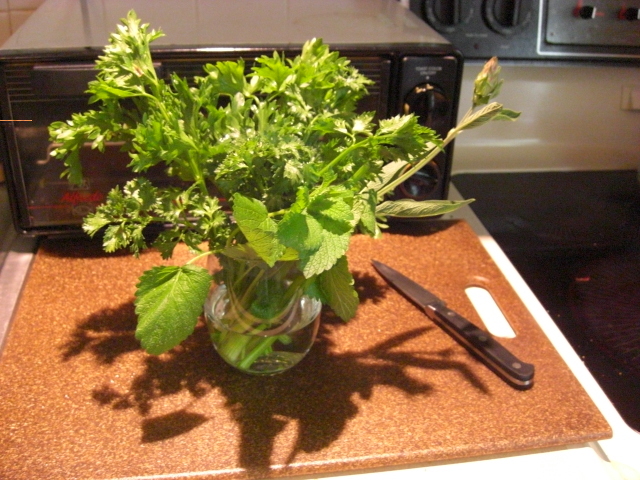 Check out my pretty herb bouquet. I covered the whole thing with a plastic bag and put it in the fridge. That’ll keep them super-fresh. I’ve already had two pots of lemon balm tea! 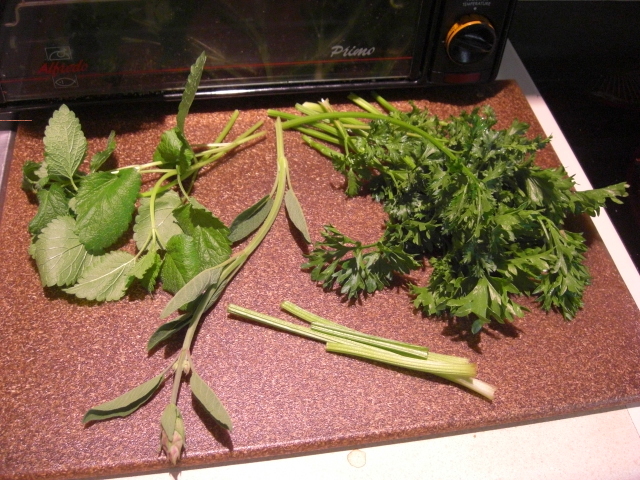 Tomorrow I’m going to make more tea with the sage buds and lemon balm. I’m not sure about the sage leaves. I may make a pasta dish with them or just let them dry for later. They seem so nice I kind of hate to dry them. The par-cel will all go into fried rice along with the green onions and beet greens. I’ve cooked the rice and have put a handful of shrimp in the fridge to defrost. Usually, I make a cup of uncooked rice, which makes about four servings. But today I made a little more than ½ a cup. It’ll be denser, but we’ll get through it faster. The strawberries are now frozen, but if last week’s any guide, they’ll get eaten before we leave, too. I chopped and froze the beet stems for another day. 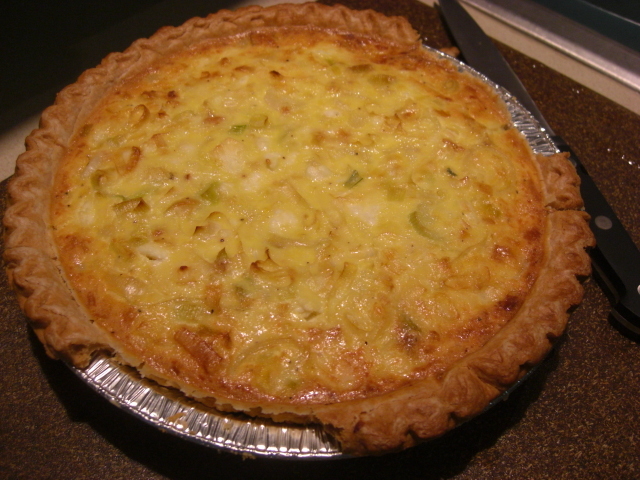 Monday I made the leek pie Natalie suggested from the Farmers’ Fresh cook book. Chris thought it was incredible. (I liked it, too, but this is definitely a Chris kind of dish.) So we have some of that left to go with our salads. Yesterday we had an afternoon peanut butter sandwich snack attack. I had mine with creamed honey, and Chris had Emily G.’s apple pie jam. 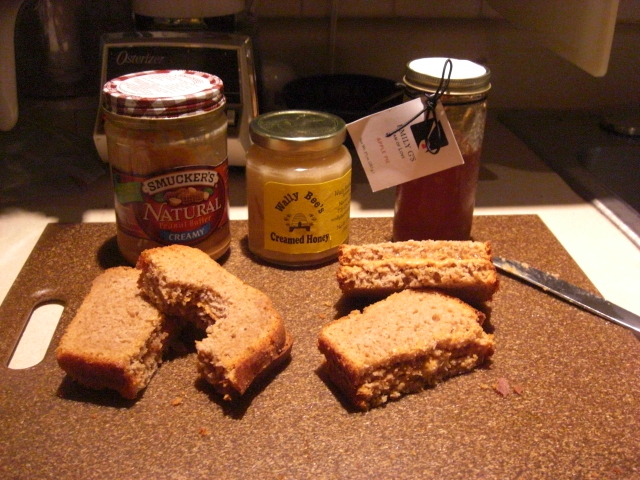 Both were on delicious, dense whole wheat bread from a CSA delivery several weeks ago. I froze it when we got it and then defrosted it a while back. Worked great. Chris and I are going to try this vacation thing again Saturday, so no post from me next week. Enjoy your food! I’ve been enjoying your blog and it inspired me to join Farmer’s Fresh. Jim and I have only been members for two weeks now but so far we love it! Have a great time in Honduras. We were just in Roatan the beginning of march (second year in a row we’ve gone)… so pretty and untouched. We can’t wait to go back.